"The Gospel is a woman's first and most important discipline, for it is the source of godliness." Outside my window... there is frost everywhere. It must have gotten really cold last night. Frost isn't something you see very often in this part of the country. I am thinking... that it's going to be hard to get things done with my husband home today. I love him dearly, and like having extra time with him, but it makes it hard to stick to our schedule! I am thankful for... my family. I know that's generic, but I am really thankful for them today. That usually happens when I get to wake up with my husband still home, and the kids running around the house just as as happy as can be. I am wearing... my animal print pajamas. I'm not big on animal prints, but this set was just so comfy looking, and it's composed of the top and capri pants. Not cotton, not silk, just very smooth and comfy without being staticy. I love these....makes it hard to want to get dressed! I am remembering... all the neat pajamas my mother wore when I was a kid. I loved to see them, and I was so happy when I got big enough, that she could pass some down to me! I am going... nowhere, hopefully! That would really hinder my list getting done today. I am currently reading... Disciplines of a Godly Woman~Excellent Book!!!! I am hoping... to figure out what we are going to do with the yard and fence today. So little money, such big dreams! We just need to figure out what we can do, and what we need to do...what the Lord wants us to do! On my mind... we got new neighbors for the first time since we bought this house 2 years ago. Out of all that time, we've only had someone live there for 3-4 months. I'm very concerned about what new neighbors mean to us. Their house is really close to ours, and there is no fence or trees or anything that stand between us in the front yard. That's where the kids play, and we don't want to be rude, and put up a privacy fence, but I want my children to be able to continue to play out there. I don't want to have to keep them in because of language and activities going on right next door. We knew this day would come, but now we are faced with it head on. Noticing that... I still have a hard time making decisions. I cannot come up with a layout for how I want our fence to go, and what kind of fence I want, and how much money I want to put into it. Frustrating. Pondering these words... too much running through my head today to stop and ponder on anything! From the kitchen... I made a fabulous 5 layer Mexican dip last night. Luckily, I decided to make a double batch, even though we hadn't tried it before, and now we are so glad that I did! We get to have that again for lunch today and we are all looking forward to it! Around the house... kids are playing and I think we will just take the day off today. We just finished the semester (because we do school until the end of June) and it would be a good time for a break. Then they can just enjoy their dad being home today! Hubby is outside trying to decide what he thinks about the fence thing. Dishes are almost done, but floor needs mopping. Living room could sure use a face lift! One of my favorite things... these Webkinz. My children love the stuffed animals, and love being able to see their animal on the computer and make rooms for it, dress it up, play games...it's really a neat thing. 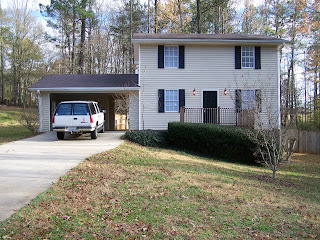 This was our house when we first bought it. It looks so different now. Keep checking back, I'll show you an updated photo of it soon! Three things I will tell you, is that the bushes in the front are gone, we have a new roof and the carport is now our living room and laundry room! The rest, you will have to wait and see! 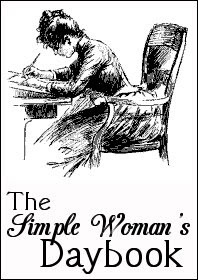 For more Simple Woman's Daybook posts, go to Peggy's blog where she graciously hosts them! I sure do hope you have nice neighbors. We are truly blessed to have very nice neighbors on either side, one is a young family and the other is an older couple (grandparents). They are kind and helpful but not nosy or gossipy or loud. What I love most about your house is all the trees! Such a lovely backdrop. I really love what you said about "so little money, such big dreams." Just having dreams is just so great! We are big dreamers on a little budget, too. I just know that God cares about all of the desires of our hearts, so if it is His will... then maybe! You have a beautiful home! Good luck with the fence stuff. I am a 35 year old follower of Christ. I'm learning that that's how I have to see my self first, above all else. Everything else I am and everything else I do, flow from first being a lover and follower of Jesus the Messiah! I have been married to my wonderful husband for 18 years now, and we have 4 beautiful children! It has been quite the journey so far, with many ups and downs...and long straight stretches where I actually longed for some ups or downs. No matter the place it takes me, my goal every day is to be in the path that the Lord has set for me. And that's why the title of this blog is In The Lord's Path...that's exactly where I want to be. I just write my ever-flowing thoughts, and try to be as open and honest as I can. May God use it for the edifying of His children. Welcome to my blog...I hope you enjoy your stay! May the grace of the Lord be with you always. Watermark theme. Theme images by tjasam. Powered by Blogger.